In a nod to his interruption of Taylor Swift at 2009's VMAs, Kanye West rushed up to the Grammys stage last night after Beck won Album Of The Year. As he accepted his award, Kanye appeared to want to take the mic from him and the audience feared he would once again rant that Beyonce should have won over Beck. 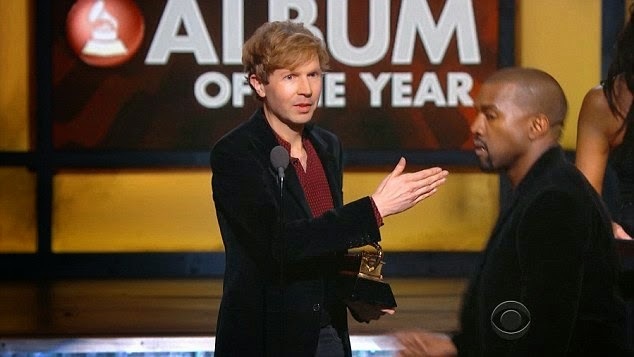 Backstage, things became a lot more heated as Kanye West launched into an epic rant on Beck and the organisers of the Grammy Awards. Speaking to Khloe Kardashian, who was reporting for E!, and other journalists; Kanye launched into a scathing attack on Beck and organisers of the event. 'We ain't gonna play with them no more. Beck needs to respect artistry and he should have given his award to Beyoncé. At this point - we're tired of it because what happens is, you keep on diminishing art and not respecting the craft and smacking people in the face after they deliver monumental music. Kanye's wife Kim looked shocked as she watched Kanye rant backstage, and eventually interrupted telling presenters they were due to catch a flight to New York. However, she agreed with Kanye and told presenters she felt that Beyonce should have been given the award. She later showed her support by posting her own shock reaction to Kanye interrupting Beck's win on her FB page. Meanwhile, TheBeygency, a group of diehard Beyonce fans have started a spoof petition on change.org to get Beyonce the AOTY Award... so funny!